Many of our undergraduate student researchers are able to conduct research thanks to mentorship provided by graduate students. Such is the case with a group of students who recently presented their research regarding avatar characters on video gaming systems and their impact on gamers' attitudes toward exercise. 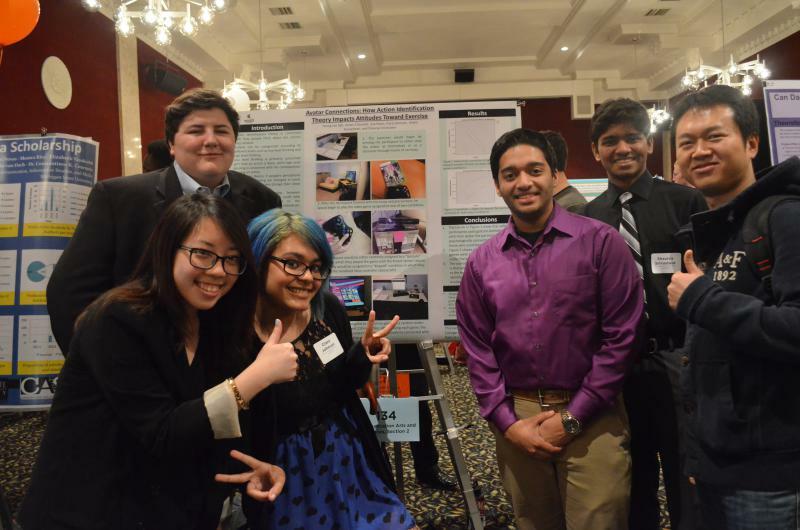 The students, pictured below, worked with Young June Sah to develop their research. Sah is a doctoral student studying media and information systems in the College of Communication Arts & Sciences. This is one phase of a broader research project that Sah will continue during his time at MSU. The undergraduate presenters for this project worked as a team, and presented as a team. Each student was responsible for explaining an element of the project at the 2014 University Undergraduate Research and Arts Forum, held on Friday, April 4, 2014. Action identification theory is concerned with how people think about the actions they conduct. Actions can be categorized according to different levels such as low level and high level thinking. Low level thinking is concerned with how an action is done, while high level thinking is concerned with consequences of doing an action. According to the theory, people usually identify with high level thinking, however, the theory also states that if people’s perceptions on low level thinking are changed in some way, then this could also change their views toward high level thinking. In our study we decided to link the effects of Action identification theory to people’s attitudes toward exercise. To do this we had participants play a videogame called “London Olympics” on the Xbox 360. Participants were randomly assigned to either a “gesture” (low level thinking) condition in which they would play the game using the Kinect motion sensor, or a “keypad” (high level thinking) condition in which the participant would use a regular Xbox controller. Participants were then assigned to play three sports events in a random order, and afterwards answered surveys about their experiences. Each of these surveys would ask participants how closely they connected with the avatar that was present in each sport event. One week later participants took another survey on their attitudes towards exercise. It is our hypothesis that participants in the gesture condition who closely connected with their avatars will show the greatest change in attitude towards exercise after one week.